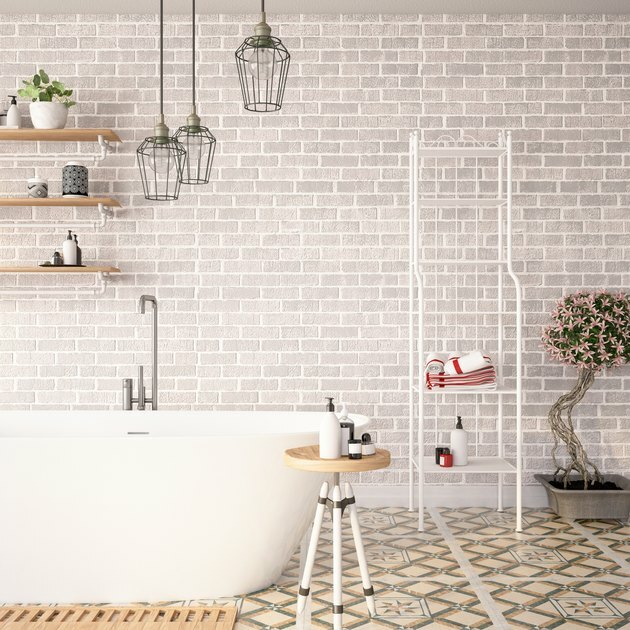 Small and bright or large and textured, there is a wide variety of tile from which to choose when you are revamping a backsplash, bathroom floor or entire living space. Once you've handpicked the perfect tile, it can be confusing when deciding how to actually lay it out. There are many debates about staggered tile vs. straight. A staggered tile floor can bring a touch of elegance to a sprawling room or add depth and texture to a small space. It's fairly easy to complete, and the payoff is a visually appealing space with an elevated design. Before you lay the first tile, take some time to consider the space. A narrow room can benefit from a staggered tile pattern that follows the walls but breaks up the space and makes it look wider. A diagonal staggered pattern across a wide space can open up other aspects of the room, such as a bank of windows or a cathedral ceiling. If there are obstacles such as vanities or islands, you'll want to lay out the tile so that you don't have thin cuts at the edges of the room. Thin cuts can make a room feel smaller, and the job certainly looks less than professionally finished. Simply laying tile to follow the lines of a room is not using the layout to your advantage. By laying tile on the diagonal or on point and staggering the pattern across the room, you add depth and a more interesting design. Small rooms benefit from a diagonal pattern, and it can hide imperfections. You will need to make more cuts for the perimeter tiles to fit snugly in the staggered tile pattern. There is an abundance of bathroom floor tile layout ideas that are relatively easy to install and work well with the staggered tile pattern. These distinguished design ideas that use a staggered tile pattern open the typically small space and bring out the best in the room's porcelain fixtures. The staggered tile pattern can be done in rows for an offset brick pattern. A herringbone pattern can add a dynamic design to the bathroom. It works well if you are using thin tiles or any size rectangle. Begin at the side of the room and stagger the tiles across the room in an L shape. Once you have the first row completed, it will follow across the room quite easily.